My family loves Peking restaurant. For generations, they would come here for Sunday lunches with my aunts and uncles, grandparents, great uncles and aunts in tow. I used to tag along whenever I used to visit and so my Peking restaurant experience spans about two decades. After moving here, I somehow found my way back here again eating the same things I used to all those years with my extended family. Although we don’t come here often, on those times that we do, we end up eating basically the same things each time. The restaurant specializes in what we called “mian shir” or, “foods of starch”. 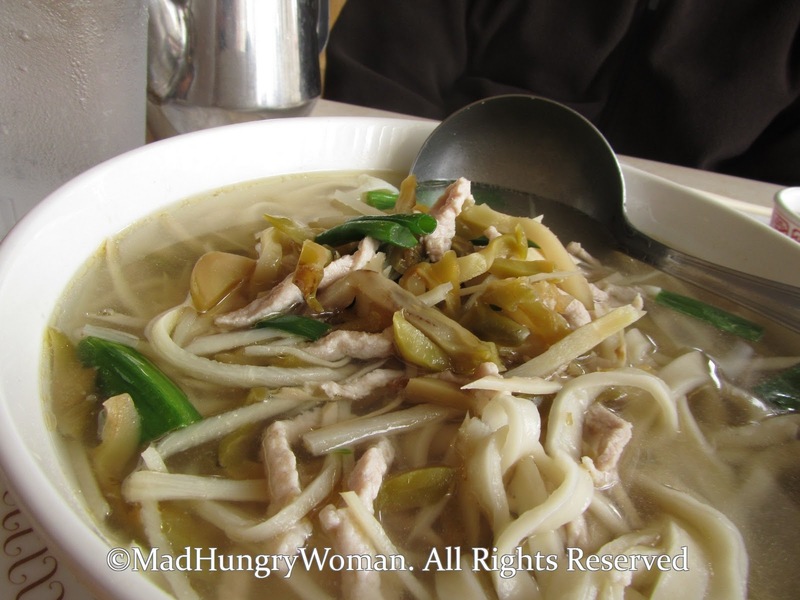 Basically, it is a northern Chinese staple, of noodles, dumplings, breads as opposed to rice. Food is generally heavier and greasier in the north to combat the harsh winter months. The cuisine focuses more on casseroles and stews rather than the stir-fries of the south — Cantonese food. The minute I enter the restaurant, the servers will ask if I wanted the roast beef with green onion pancake roll ($7.85) and potstickers ($6.25/10 pieces), called pan fried dumplings on the menu. I tell her “of course” and she rushes off into the kitchen to place my order. After we are settled and perusing the menu, she comes back and brings us tea and tells me that my order is in and what else I needed. I tell her I wanted the beancurd with chives and pork and some preserved vegetables with pork soup noodles. I pondered about ordering boiled dumplings but she looks at me and tells me I already have potstickers and I don’t need rice either seeing I’ve got a carb-packed meal to come. Ahhh you’ve gotta love these old Asian servers who think they are your aunties and know better than you do. The potstickers are awesome here. I love the crispiness of the bottom side with the juicy meat filling inside. These are greasy, but oh so good. I usually make a sauce of 3 parts vinegar, 1 part soy sauce and a spoon of chili sauce for the potstickers to dip in. One portion of 10 potstickers don’t last very long since everyone is fighting over them. Stir fried beancurd with chives and pork is very tasty and I wish I had some rice to go with it, but I didn’t want to ask. Whenever I eat here I feel like if I asked for something they already told me no, I would get yelled at, like how I would at home. Funny, but true. But she was right, I didn’t need anymore starchy foods. We had more to come. Roast beef with green onion pancake roll is very filling and I like the sweet sauce on the side. I always request they put it on the side because otherwise they will slather way too much on to the sandwich and I can’t taste the beef anymore. It’s just a mouthful of sweet. This way, everyone can add as little or as much as they like and everyone is happy. 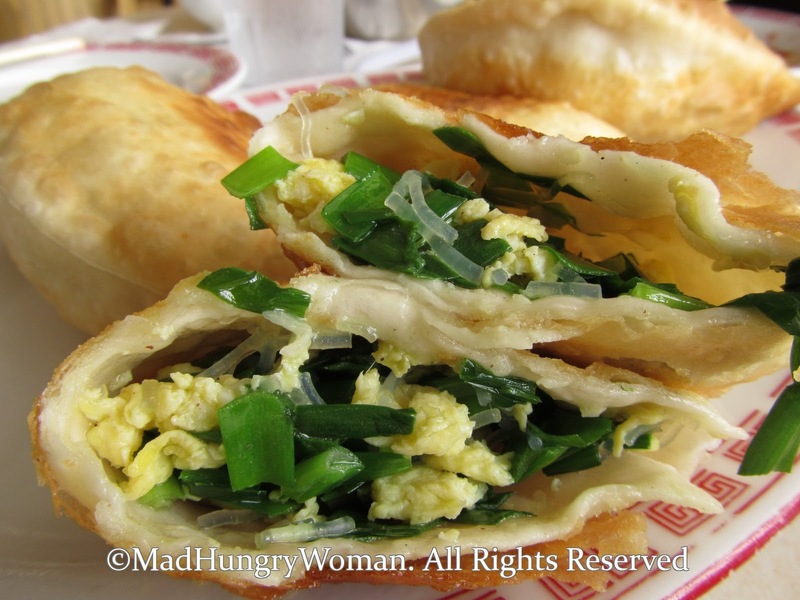 The beef is like what my mother makes, a braised five spiced beef, sliced and rolled into a scallion pancake (cong you bing) along with fresh scallions and cilantro. It always makes me happy eating this regardless of where I have it and how it is made. It reminds me of my mom’s home cooking except my mom would use the beef on regular bread to make sandwiches with or in a noodle soup, which brings me to the noodle soup we ordered. Preserved vegetables with pork in a soup noodle arrive and I immediately knew it would not be satisfactory. We asked for hand cut noodles which were the only good thing going for it. There wasn’t enough broth and the noodles quickly soaked up whatever little broth was in the bowl. The preserved vegetables and pork to noodle ratio was about 1 to 4 which made for very unsatisfactory eating. I like my soup noodles with a lot of soup and much more toppings than this. I brought it home and re-hashed it into another noodle soup meal a few nights later. Service is brisk and abrupt. If you are looking for a smile or a joke, this isn’t the place to find it. What you see is what you get. They will take your order, bring your food, perhaps a box for your unfinished food, bring you the check. Don’t expect anything more and you won’t be disappointed. With that in mind, come for the potstickers, the beef rolls and steamed dumplings if you are not getting the potstickers. Know that whatever northern “starch” specialty item you order, it’ll be good.